It's the last week of the 2017 NFL regular-season until next year September, so it's quite fitting that the final week is going to be an energetic extravaganza. Week 17 is the first and only time where all 16 matchups will air on the same day in the 2017 season. Playoff seeds will be set, and the season will either end in triumph or in disappointment for teams playing this weekend. Because New Year's Eve is on Sunday, and no matchup could be aired later in the day that wouldn't affect the competitive balance of the earlier matches, there is no Sunday Night Football matchup in Week 17. There were also a few other matchups that were flexed to feature later during the day to eliminate any advantages, including Jaguars at Titans, Saints at Buccaneers, Bills at Dolphins, Bengals at Ravens, and Panthers at Falcons. Grizzly Gambling took a final look at the biggest matchups for the regular-season and did the necessary research to provide you with valuable insight into possible upsets, guaranteed wins, and early point spreads on three of the most interesting games on Sunday that will give you the much-needed edge for your football sports betting action for week 17. Week 16 of the NFL was focused on the playoff picture, so several teams were keeping a close eye on the scoreboards on Sunday. After the results came in on Saturday, 10 teams managed to enter Sunday and Monday with the hopes of clinching something worthwhile, be it a first-round bye, home-field advantage during the playoffs, a postseason berth, or a division title. The early games on Sunday were highlighted by a matchup that will go a long way to decide the NFC South division. The Saints' victory over the Falcons means that the Saints are only one victory away from claiming the division title. The Carolina Panthers, who defeated the Buccaneers on Sunday, are prowling in case New Orleans slip in Week 17. The main game of Sunday's late matchups included the Cowboys against the Seahawks, which ended in a playoff elimination match in Dallas. Neither Dallas nor Seattle entered Week 16 with a great chance to reach the postseason, but the Seahawks managed to pull off an ugly win that kept their postseason hopes alive. 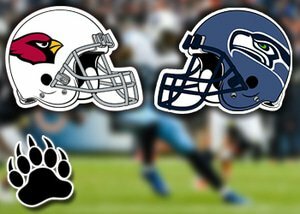 The Seattle Seahawks and the Arizona Cardinals will meet at the CenturyLink Field for NFL action on Sunday. The Arizona Cardinals will look to play spoiler as they won at least 8 games for the fifth time in the last 7 years. The Cardinals have lost 4 of their last 5 games on the road. Draw Stanton has completed 51.2% of his passes for 749 yards, 4 interceptions, and 5 touchdowns. Stanton has 2 TD passes in 2 of his last 3 games. J.J Nelson, along with Larry Fitzgerald, has 8 touchdowns and 1,591 receiving yards combined, while Jaron Brown has a total of 30 receptions. Arizona's ground game is on average 84.7 yards per game, and Adrian Peterson is leading with 448 yards and 2 touchdowns. Arizona's defense is allowing 311.9 yards and 22.5 points per game. Antoine Bethea has 5 interceptions, Karlos Dansby has 89 tackles, and Chandler Jones has 15 sacks for the Arizona Cardinals. The Seattle Seahawks will need a win to have a chance at making it into the NFC playoffs. The Seahawks have lost 3 of their last 4 games at home. Russell Wilson has completed 61.3% of his passes for 3,762 yards, 11 interceptions, and 32 touchdowns. Wilson has 2 or more TD passes in 9 of his last 10 games. Paul Richardson, along with Doug Baldwin, has 12 touchdowns and 1,604 receiving yards combined, while Tyler Lockett has a total of 42 receptions. Seattle's ground game is on average 101.9 yards per game, and Wilson is leading with 550 yards and 3 touchdowns. Seattle's defense is allowing 327.5 yards and 20.4 points per game. Michael Bennett has 8.5 sacks, Bobby Wagner has 130 tackles, and Earl Thomas has 2 interceptions for the Seattle Seahawks. The Cardinals in the last 7 road games is 1-6 ATS, in the last 5 versus NFC West is 1-3-1 ATS, and in the last 11 versus NFC is 3-7-1 ATS. The Seahawks in the last 30 games in December is 21-8-7 ATS, in the last 5 home games is 1-4 ATS, and in the last 10 games after an ATS win is 3-7 ATS. The road team in the last 6 meetings is 5-0-1 ATS and the underdog in the last 5 meetings is 4-0-1 ATS. The Arizona Cardinals will have the perfect opportunity to prevent their division rivals from making it to the playoffs. Although a win will not give the Cardinals the success they need for the season, it will eliminate the edge and end the season on a high note. However, that isn't likely to happen on Sunday. The defense of the Seattle Seahawks is finding ways to obtain stops despite their injuries, allowing 13 or fewer points in 3 of their last 5 games. The Cardinals aren't the same team when playing on the road as opposed to playing at home. The Seahawks are well coached and too experienced, with a playoff possibility, at home to give up a win. Therefore, we are going with the Seahawks to win by double digits. The Tennessee Titans and the Jacksonville Jaguars will meet at the Nissan Stadium for Sunday NFL action. The Jacksonville Jaguars need to continue building momentum as they head into the playoffs while claiming 11 wins for the first time since 2007. The Jaguars split their last 6 games on the road. Blake Bortles has completed 61.4% of his passes for 3,529 yards, 11 interceptions, and 21 touchdowns. Bortles has 2 or more TD passes in the last 4 games. Marqise Lee, along with Keelan Cole, has 6 touchdowns and 1,417 receiving yards combined, while Allen Hurns has a total of 36 receptions. Jacksonville's ground game is on average 145.3 yards per game, and Leonard Fournette is leading with 971 yards and 9 touchdowns. Jacksonville's defense is allowing 289.7 yards and 16.9 points per game. A.J Bouye has 6 interceptions, Calais Campbell has 14.5 sacks, and Telvin Smith has 93 tackles for the Jacksonville Jaguars. The Tennessee Titans can reach the playoffs for the first time since 2008 with a win this weekend. The Titans won 5 of their last 6 home games. Marcus Mariota completed 62.3% of his passes for 15 interceptions, 12 touchdowns, and 3,098 yards. Mariota has one or fewer TD passes in 6 of his last 7 games. Rishard Matthews, together with Delanie Walker, has seven touchdowns and 1,576 receiving yards combined, and Eric Decker has 51 receptions. Tennessee's ground game is on average 114.5 yards per game, while Derrick Henry is leading with 5 touchdowns and 693 yards. Tennessee's defense is allowing 334.6 yards and 23.1 points per game. Derrick Morgan has 7.5 sacks, Kevin Byard has a total of 6 interceptions, and Wesley Woodyard has 119 tackles for the Titans. The Jaguars in the last 10 road games is 7-3 ATS, versus a team with a record of wins is 5-1 ATS, and in the last 8 versus AFC South is 7-1 ATS. The Titans in the last 11 home games is 8-2-1 ATS, in the last 55 versus AFC is 13-38-4 ATS, and in the last 68 overall games is 21-43-4 ATS. The Jaguars in the last 14 meetings is 9-3-2 ATS, the home team in the last 6 meetings is 4-1-1 ATS, and the favourite in the last 6 meetings is 4-1-1 ATS. We usually side with the greater team and take the free points. However, the Titans are playing at home where they've been delivering the best football this season, and they have the chance to reach the playoffs with a victory against the Jaguars for the first time since 2008. It's difficult not to place your hopes on the Titans. The Jaguars are locked into their spot and will need to stay healthy for the important wildcard game next week. We also witnessed the Jaguars being defeated by the 49ers, and while Tennessee might not have the offensive firepower of the 49ers, they do offer a powerful running game that is sure to do some damage. We are siding with the Titans in this matchup to win by at least a touchdown. The Miami Dolphins and the Buffalo Bills will meet at the Hard Rock Stadium for Sunday NFL action. The Buffalo Bills require a win for a chance to make it to the playoffs for the first time since 1999. The Bills have lost 4 of their last 5 games on the road. Tyrod Taylor has completed 62.1% of his passes for 2,595 yards, 4 interceptions, and 13 touchdowns. Taylor has 1 or less TD passes in his last 6 games. LeSean McCoy, along with Charles Clay, has 4 touchdowns and 920 receiving yards combined, while Deonte Thompson has a total of 25 receptions. Buffalo's ground game is on average 126.1 yards per game, and McCoy is leading with 1,128 yards and 6 touchdowns. Buffalo's defense is allowing 355.1 yards and 22.9 points per game. Micah Hyde has 5 interceptions, Shaq Lawson has 4 sacks, and Preston Brown has 131 tackles for the Buffalo Bills. The Miami Dolphins will be playing spoiler to finish the 2017 season with at least 7 wins for the fifth time in the last 6 years. The Dolphins have won 4 of their last 6 games at home. Jay Cutler has completed 62.1% of his passes for 14 interceptions, 19 touchdowns, and 2,660 yards. Cutler has 2 or more TD passes in 6 of his last 9 games. Jarvis Landry, along with Kenny Stills, has 14 touchdowns and 1,708 receiving yards combined, while DeVante Parker has a total of 51 receptions. Miami's ground game is on average 86.3 yards per game, and Kenyan Drake is leading with 569 yards and 3 touchdowns. Miami's defense is allowing 332.8 yards and 24.5 points per game. Xavien Howard has 4 interceptions, Cameron Wake has 9 sacks, and Reshad Jones has 114 tackles for the Miami Dolphins. The Bills in the last 9 versus AFC East is 2-7 ATS, in the last 5 road games is 1-4 ATS, and in the last 5 road games against a team with a losing record at home is 0-5 ATS. The Dolphins in the last 6 home games is 3-1-2 ATS, in the last 6 versus AFC East is 1-4-1 ATS, and in the last 10 overall games is 2-6-2 ATS. The home team in the last 8 meetings is 6-2 ATS, the favourite in the last 13 meetings is 9-4 ATS, and the over in the last 5 meetings is 5-0 ATS. The Dolphins have been a sensational team this season and would love to prevent their division rivals from reaching the playoffs. However, the Dolphins continue to shoot themselves in the foot over the last few months. The Bills, on the other hand, have done enough the last few months to make this matchup meaningful, and the defense of the Dolphins couldn't stop Taylor or McCoy when they met a few weeks ago. We wouldn't be shocked if the Dolphins manage to steal the game with the way they've been playing at home. However, the Bills are the better team, and far more consistent this season. We are therefore picking the Bills to win the game this weekend. Week 17 is going to be an action-packed weekend featuring 16 explosive games on Sunday. This is sure to attract a wide range of professional and would-be bettors that will try to predict upsets and guaranteed wins to increase their overall bankroll before the regular season comes to an end. Apart from the above-mentioned matchups, you can head over to Sports Interaction to view the entire game schedule for Sunday along with betting odds and updated point spreads to help you increase your chances of winning. If you interested in testing a new sportsbook in Canada, you can make your way to Spin Palace Sports for more competitive odds on every game this weekend. As we say goodbye to the 2017 NFL regular season this weekend, there will be loads of recreational and professional bettors flooding online sportsbooks in Canada to place their bets. To get an edge over the bookmakers this weekend, and to obtain the best odds for your hard-earned money, you can't go wrong by first browsing through our comprehensive sports betting in Canada article on all things sports betting related. This will give you the best advice and betting tips before you decide to place your bets on the football games this weekend. Now that you have everything you need, its time to take our informative predictions on the top games for Week 17 and place a winning wager.